Huge Savings Item! Free Shipping Included! 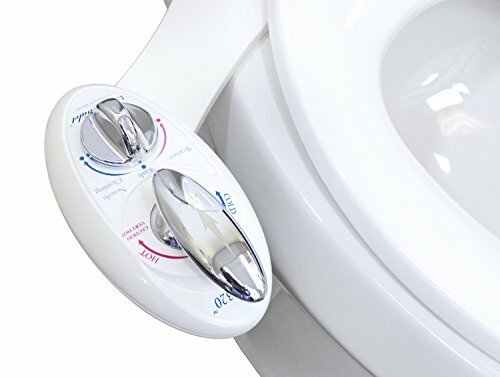 Save 18% on the Luxe Bidet Neo 320 - Self Cleaning Dual Nozzle - Hot and Cold Water Non-Electric Mechanical Bidet Toilet Attachment (white and white) by LUXE Bidet at Walk In Tub Showers. MPN: Neo-320-white. Hurry! Limited time offer. Offer valid only while supplies last. The Luxe Bidet Neo 320 is a dual nozzle, fresh and warm water, non-electric mechanical bidet attachment in the Luxe Bidet Neo Elite Series. The Luxe Bidet Neo 320 is a dual nozzle, fresh and warm water, non-electric mechanical bidet attachment in the Luxe Bidet Neo Elite Series. The hygienic nozzle guard gate ensures the bidet is always ready for clean operation. The guard gate is easily opened for access to the nozzle. The unobtrusive control panel features a polished silver lever that allows the user to activate and adjust water pressure and water temperature. Neo bidets, just like quality faucets and showerheads, use high-pressure valves with a metal or ceramic core. Braided steel hoses are included to connect the bidet to the fresh water source. An adjustable-length polyurethane hose with metal end is included to connect the bidet to the hot water source. These fittings match standard U.S. plumbing sizes. If you have any questions about this product by LUXE Bidet, contact us by completing and submitting the form below. If you are looking for a specif part number, please include it with your message.